I think Tim Smit’s aim for The Big Lunch www.thebiglunch.com to “get people out on their street, raise a glass and share a bite with their neighbours” was successfully met on Sunday the 18th of July. 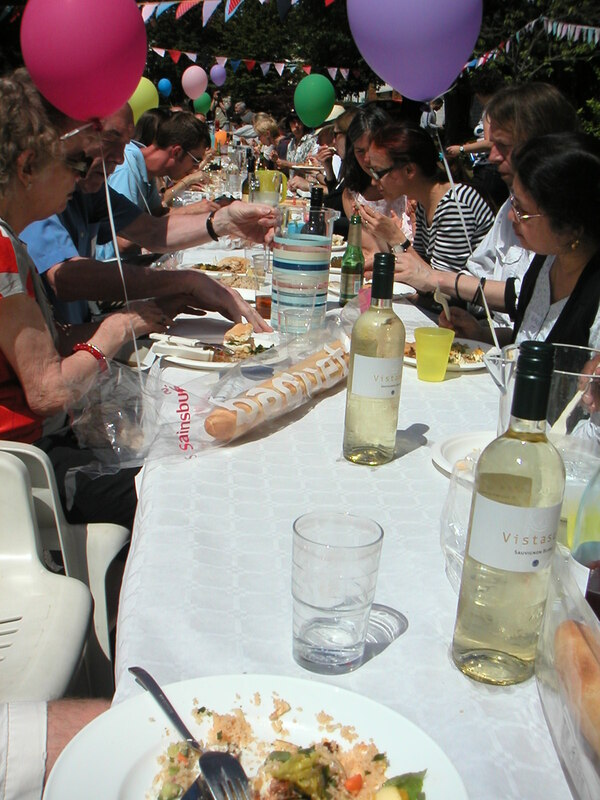 The turnout to our Big Lunch was excellent with c60 people joining in the celebrations. Everyone had been asked to bring two dishes (one main + one side) and bring a pudding if they fancied; there was a BBQ area for those who like to demonstrate their cooking skills (guess who?) and a BYO drinks tent, games + face painting and LIVE music. 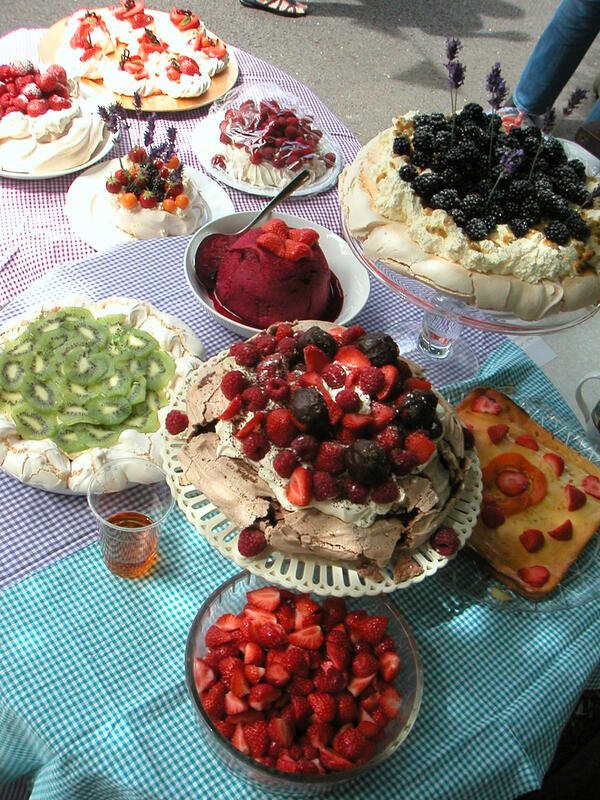 I had been asked to judge the Pavlova competition which was no mean task. In the end I chose a fabulously luscious one with passion fruit folden through the cream, topped with blackberries and lavender sprigs. The merengue was perfect: glossy and crunchy on the outside and chewy on the inside. The runner-up was an excellent chocolate Pavlova which was decorated with mixed berries including chocolate dipped strawberries. Recipes to follow as soon as I have managed to winkle them out of the Pavlovas’ creators. 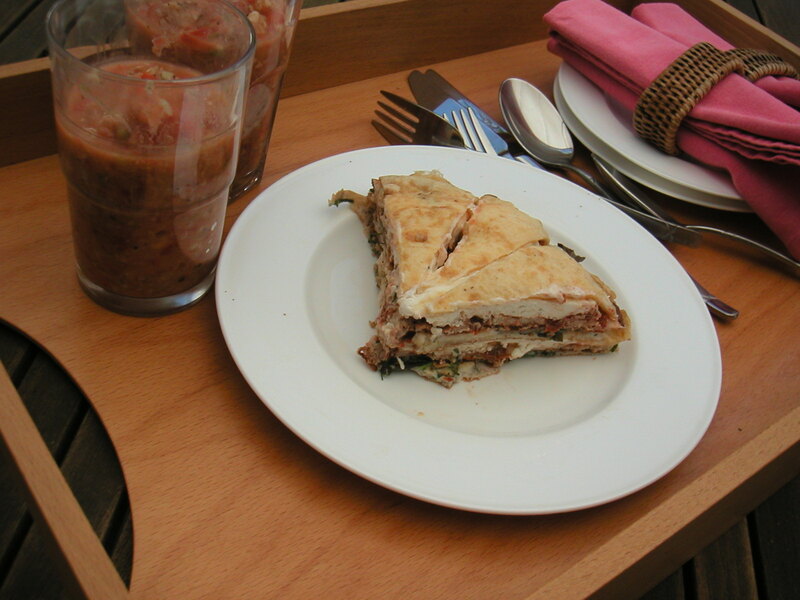 Our contribution to the event was a gazpacho and crespeou, multi layered “cake” from Provence made up of savoury omelettes. I used three different flavours: herb, cheese and tomato, all held together by layers of fresh goats cheese. Here’s the recipe which is really easy; you could make the crespeou the day before and chill until needed although you may lose some of the freshness of the colours. It’s really very easy to do and assemble: just make sure you’ve got the mise en place ready before you start i.e. everything prepared and to hand. I used a medium sized non-stick fyring pan but you could create a cake with more height (and more drama!) if you used a smaller pan. 5. start with the herb omelettte and pour half the mixture into the pan; unlike a traditional omelette, after the initial stirring of the mixture in the pan, cook until set. You may have noticed that I did not add any salt: I don’t think the cake needs it, because the sun-dried tomatoes and Parmesan are quite savoury enough by themselves. The gazpacho is based on a Moro recipe which I have used hundreds of times. This intensely flavoursome “liquid salad” is the easiest thing to make and I believe is at its best when it is really hot outside and tomatoes are at their reddest, sweetest, juiciest best. Don’t bother making this soup out of season, it’s not worth it! You will notice the addition of breadcrumbs: if you are familiar with the supermarket versions of gazpacho this may come as a surprise, but I think it adds some body and texture which I like. Once the soup has been thoroughly chilled (at least 2 hours in the fridge) you can serve it as it is, or add some bits of Serrano ham, hard boiled eggs or extra tomato/pepper/onion. I like to serve gazpacho in clear tumblers or in clear glass bowls. Sometimes I use (these so kitsch they are stylish) 1970’s glasses which I think were originally intended for prawn cocktails. They consist of two clear glass pieces: a bowl with a dish that hangs in the bowl and I put crushed ice in the bottom bowl. Salad in a glass! Can’t think of anything better when it’s hot. Enjoy. With a glass of French rose. This entry was posted in crespeou, food for friends, gazpacho, real food, salad days and tagged crespeou, eating for health, feel-good factor, gazpacho, Provence, seasonal food, seasonal veg. Bookmark the permalink.